Every organisation starts somewhere...we started in a pub! 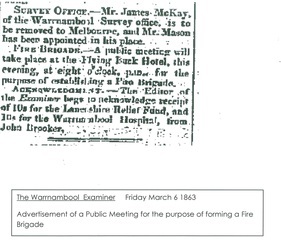 Leading up to 1863 there were a couple of attempts to form a Fire Brigade in Warrnambool. The need for a Brigade had been recognised, but organisational skills and resources were lacking. In the 1850s, most able bodied men were either at the 'diggings' looking for gold or thinking about going there. In March 1863 however, this changed, and enough impetus was present in the fledgling community for a Brigade to be formed and to continue to exist. 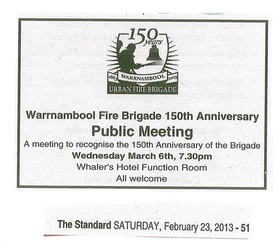 As part of recognising and celebrating our history the Brigade held a public meeting on the evening of the 6th of March 2013, the same date that 150 years before, the Brigade was formed. In aligning with our history, the public meeting this time was at the Whaler's Hotel, on the corner of Timor and Liebig Streets. This is just across the road from the site of the first meeting, at the Flying Buck. Held on the same date, March 6th, the meeting was well attended by over 50 people. In keeping wih the purpose of marking and showing respect to our beginnings, the agenda saw speakers cover past, present and future. The minutes of the first meeting where read by Firefighter Mick Corbett, a long-standing and highly respected member of the Brigade. Then Secretary Bryan Wills gave an interesting and amusing history of the Brigade. Bryan gave great context to the days of the 1860's when the Brigade was formed. At that time we were a British Colony and Australia was not yet a country. Ned Kelly was 9 years old and in two months time Burke and Will's remains would be returned from the outback. 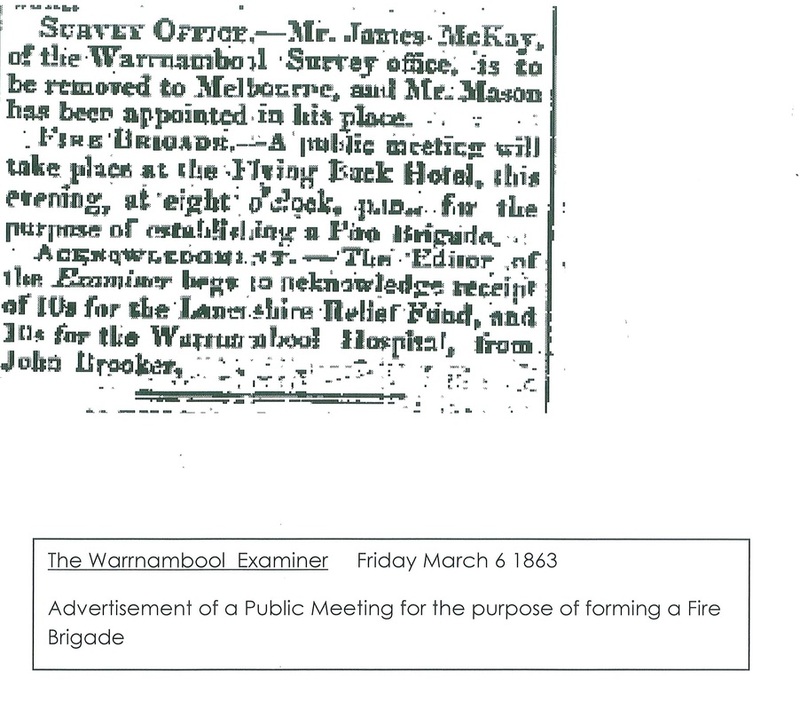 Warrnambool was a town served by a port with no trains or roads, and reticulated water would be 30 years off. Two reports were presented to the meeting. The first by Officer in Charge, Operations Officer Henry Barton, and the second by Senior Volunteer Officer, Leiutenant Wayne Rooke. Henry worked through the theme of the future and what it might hold, and how although we are always looking for and wanting new trucks and a new station and more equipment, we get the job done with what we have. He also touched on the Brigade's proud reputation of being a truly integrated Brigade. Wayne in turn talked about volunteerism, stating that in the 150 years of the Broigae we have had over 1100 volunteer members. 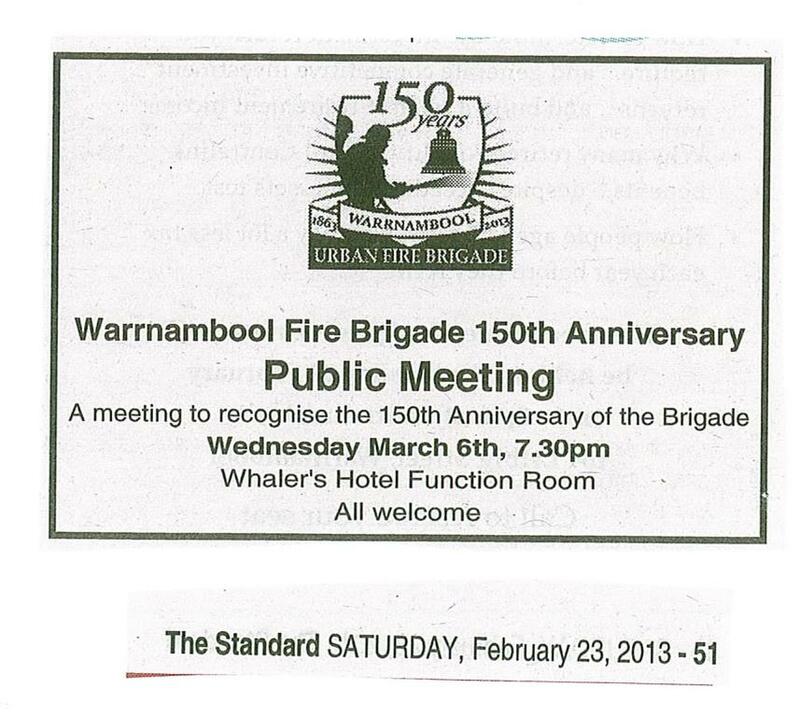 In general business Firefighter and Assistant Secretary Julie Owens moved a motion of thanks to the Warrnambool City Council and its preceeding entities for the support and encouragement given to the Brigade over its 150 year history. Second Leiutenant Brendan O'Neill then moved a motion of thanks to our fellow emergency services and supporting Brigades. He recouted a story from the late 1800's were the Brigade had to break in to the fire station to get the engine and equipment to fight a fire, and gracefully the local constabulary did not charge members with breaking and entering. Both motions were passed unanimously. The historic evening finished with refreshments and a light supper.